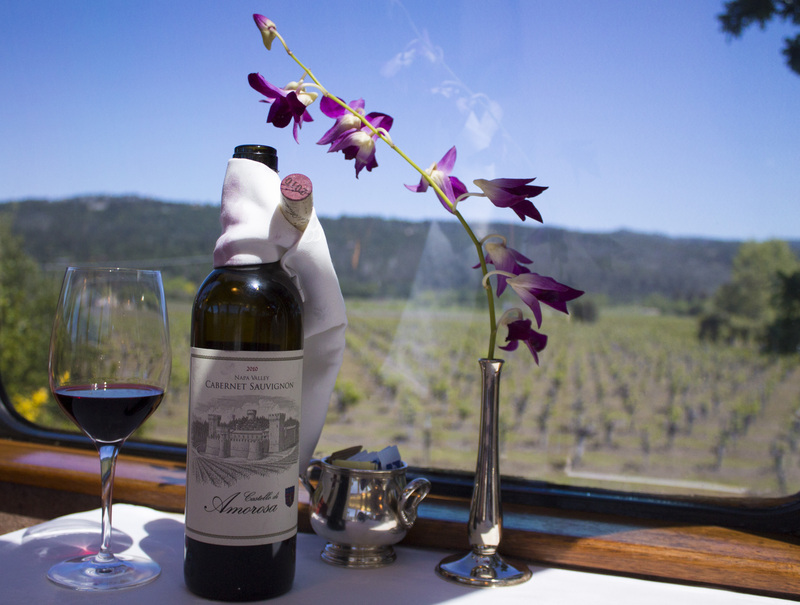 If traveling throughout the picturesque towns of Napa, Yountville, Oakville, Rutherford, and St. Helena, aboard a charming train while dining on a delicious meal adorned with touches of local ingredients and wine sounds fantastic, then the Napa Valley Wine Train is for you. While staying in San Francisco for a week, I knew I wanted to get out of the city and check out some surrounding towns, but I didn’t want to rent a car. Pairing my extreme road rage with all the insane Bay area city roads is a combination the world doesn’t need to experience. Luckily, reaching Napa is easy and near effortless via a ferry or bus connection (depending on the day of the week), eliminating all self-navigating frustrations that car renting can bring, and making for the PERFECT day trip out of the city. 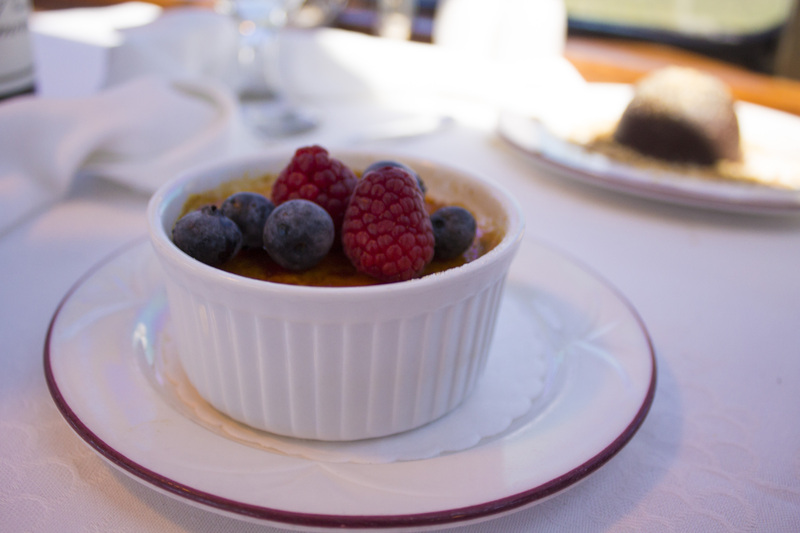 With different train journey options, such as lunch, sunset dinners and special events, I opted for the lunch served in the fully restored 1952 Vista Dome car, which is the fanciest onboard dining experience. Other choices include a 1915-1917 Pullman Dining Car and even an open-air, western-themed Silverado Car which specializes in barbecue; each option ranges in prices, with the Silverado being the most affordable and the Vista Dome being in the top-tier. Depending on your budget, there is definitely a dining option that fits every price point, and taking in the views of the passing vineyards and sampling local wines can be enjoyed by all. My day started with an 8:30 A.M. departure from the Ferry Building 1 terminal in San Francisco. This was the hardest part of the journey for me, because I don’t do mornings, but luckily there are some GREAT restaurants in the marketplace inside the ferry building to grab a small bite and coffee(s). After a short 50 minute ferry ride across the Bay to Vallejo, the Wine Train shuttle was conveniently waiting for me, and the rest of those also joining, right at the end of the ferry dock. After a quick check-in, we were off on the 30 minute shuttle drive to the Wine Train station, and no road rage or navigating took place on my part (score!). Once we arrived at the Wine Train station, we had about 30 minutes until boarding, where all passengers can enjoy the small bar, which serves bar snacks and a variety of local wines. If 10 am is too early for wine sampling in your eyes, go for the mimosa, which is what I did. By the time you finish the last sip of champagne, you’ll be boarding which ever dining car you selected, and that’s when the fun begins. While all dining cars are spectacular, the Vista Dome, in my opinion, is the way to go. If the other cars are full of passengers (which was the case when I traveled), then you will be paired with another couple/party at the same table. If you’re looking for a more romantic or private option, this is where the Vista Dome comes in. Guaranteed private seating, larger, rounded windows and no skipping on attention to detail, dining in the Dome car really creates a special memory and sets the tone for the entire trip. All passengers are encouraged to walk around the train and to explore the different cars. However, during dining, the Vista Dome is reserved for those with access only. The Wine Train is so explorable in fact, that travelers are urged to even pop into the kitchen and mingle with the chef. Complete with a large kitchen viewing area, it is impressive to see such a small, narrow kitchen line capable of producing such large quantities of top quality food. And the chef? He’s quite the character, with a huge personality and encourages photos of the kitchen in action. So what’s the dining experience like? Like pure, wonderful, delicious heaven. Once seated, I was given a welcome glass of champagne and began the difficult task of choosing from the amazing dining options sitting in front of me. From lamb chops and halibut, to smoked salmon crêpes and tiramisu, I could have easily tried one of each. For the Hors d’Oeuvre course, I chose the flourless yam ravioli; stuffed with house-smoked goat cheese and topped with grape relish. 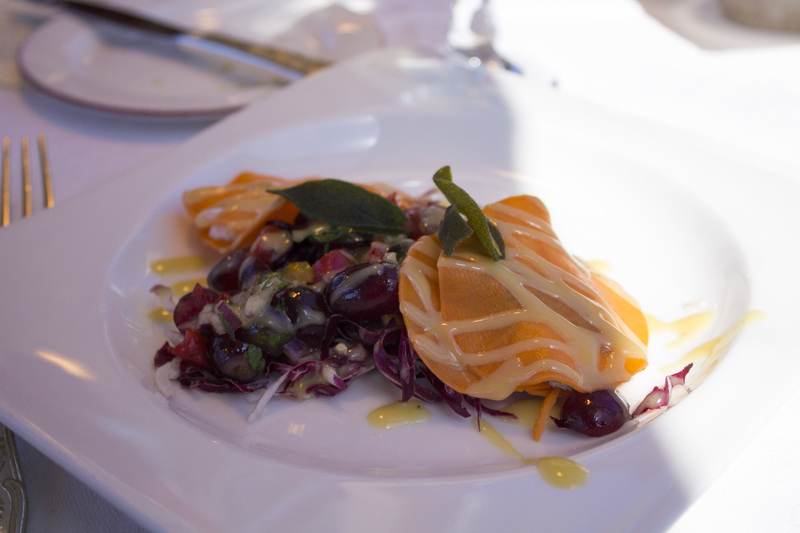 Now, when you think of ravioli, you think of hot, pasta-like dishes, however this was an inventive way of serving a salad. Served chilled, yams are manipulated to take on ravioli shapes, with the filling being goat cheese, and the crispy grape relish was the perfect complement to the dish. I absolutely loved this plate, and was very happy with my choice. While each dish has a suggested wine pairing, I chose to order a bottle of Castello di Amorosa Cabernet Sauvignon to enjoy with the rest of my meal. 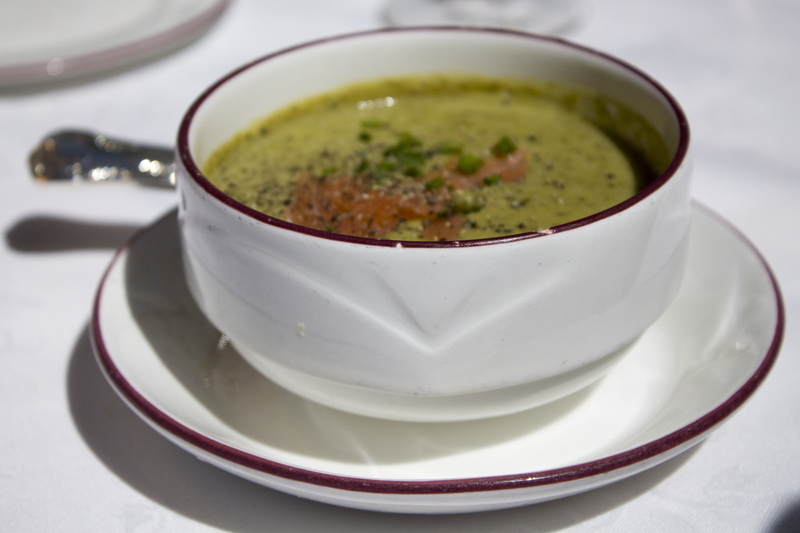 My choice for the first course was the soup du jour, which was an asparagus soup topped with smoked salmon. For some unexplainable reason, this course was reminiscent of a kicked-up split pea soup, as it had the same memorable, tasty texture. After a cold morning start catching the early ferry, a warm bowl of this culinary magic was a perfect way to get the party train rolling. 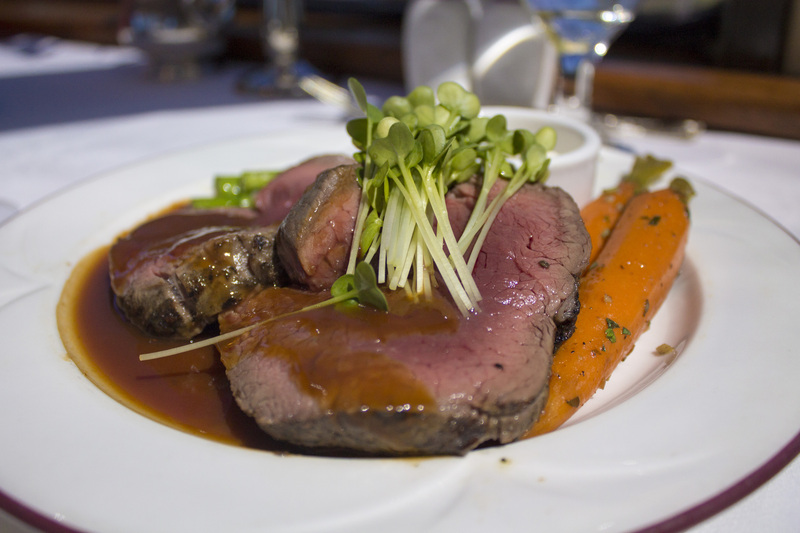 The BEST dish of the day- The main entrée, which I chose the signature Wine Train dish of roasted beef tenderloin; served with perfectly roasted carrots, asparagus and potatoes in a Zinfandel reduction topped with horseradish cream. It was rare. It was delicious. I almost licked the plate. After annihilating my entrée, I couldn’t resist the crème brûlée topped with fresh berries for the dessert course. After the entree, we were all encouraged to explore the train, allowing some time between the main course and dessert, which is the perfect way to make a little room for the last leg of the journey. Video of the rolling hills and vineyards seen through the Vista Dome windows. At the end of the three-hour journey, I was pleasantly stuffed and in need of a nap! Luckily, I had time to explore downtown Napa for a bit before the shuttle took us back to the ferry, so I was able to burn off some of the wine I had. Local wineries and tastings have paired up with the Wine Train, offering passengers great discounts should you want to continue wine sampling when waiting for the shuttle, all in walking distance of the station. After contemplating another glass, I decided I had hit my limit for the time being. 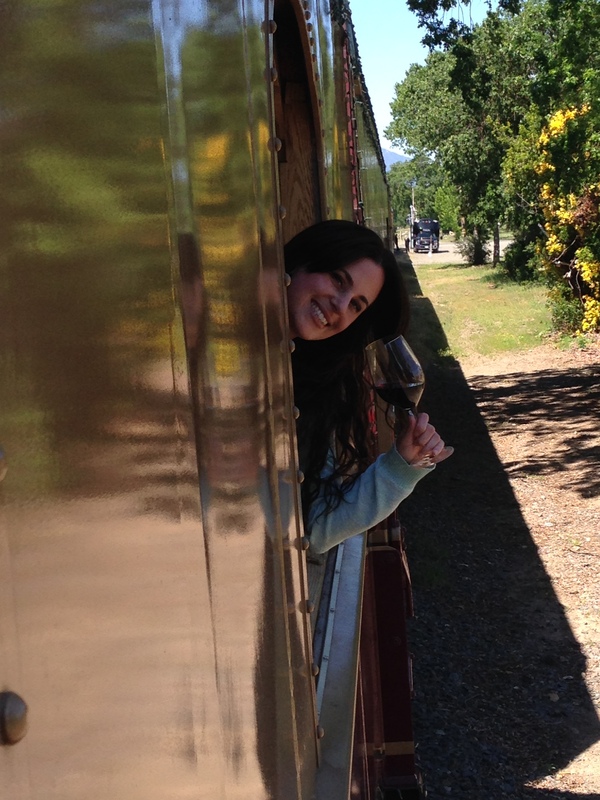 The Napa Valley Wine Train is a phenomenal, exciting and delicious day trip when visiting San Francisco. I thoroughly enjoyed my time and will definitely be back to check out that Silverado dining car! Heaven – your post is like Paradise! I so want to do this, and this is the first summer I won’t be going to San Fran at all..it’ll have to wait a year…darn. You go every summer?! I live in LA and don’t even make it that often, though I do want to change that. Definitely check it out next time you’re there! Thank you so much for spending your day with us! Wonderful words.